The Abu Simbel temples are two massive rock temples at Abu Simbel (Arabic: أبو سمبل‎), a village in Nubia, Upper Egypt, near the border with Sudan. They are situated on the western bank of Lake Nasser, about 230 km (140 mi) southwest of Aswan (about 300 km (190 mi) by road). The complex is part of the UNESCO World Heritage Site known as the "Nubian Monuments", which run from Abu Simbel downriver to Philae (near Aswan). The twin temples were originally carved out of the mountainside in the 13th century BC, during the 19th dynasty reign of the Pharaoh Ramesses II. They serve as a lasting monument to the king and his queen Nefertari, and commemorate his victory at the Battle of Kadesh. Their huge external rock relief figures have become iconic. The complex was relocated in its entirety in 1968 under the supervision of a Polish archaeologist, Kazimierz Michałowski, on an artificial hill made from a domed structure, high above the Aswan High Dam reservoir. The relocation of the temples was necessary or they would have been submerged during the creation of Lake Nasser, the massive artificial water reservoir formed after the building of the Aswan High Dam on the Nile River. During his reign, Ramesses II embarked on an extensive building program throughout Egypt and Nubia, which Egypt controlled. Nubia was very important to the Egyptians because it was a source of gold and many other precious trade goods. He, therefore, built several grand temples there in order to impress upon the Nubians Egypt's might and Egyptianize the people of Nubia. The most famous temples are the rock-cut temples near the modern village of Abu Simbel, at the Second Nile Cataract, the border between Lower Nubia and Upper Nubia. 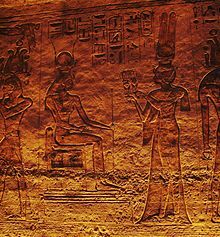 There are two temples, the Great Temple, dedicated to Ramesses II himself, and the Small Temple, dedicated to his chief wife Queen Amun-her-khepeshef. Construction of the temple complex started in approximately 1264 BC and lasted for about 20 years, until 1244 BC. It was known as the "Temple of Ramesses, beloved by Amun". With the passage of time, the temples fell into disuse and eventually became covered by sand. By the 6th century BC, the sand already covered the statues of the main temple up to their knees. The temple was forgotten until 1813, when Swiss orientalist Jean-Louis Burckhardt found the top frieze of the main temple. Burckhardt talked about his discovery with Italian explorer Giovanni Belzoni, who travelled to the site, but was unable to dig out an entry to the temple. Belzoni returned in 1817, this time succeeding in his attempt to enter the complex. A detailed early description of the temples, together with contemporaneous line drawings, can be found in Edward William Lane's Description of Egypt (1825–1828). The collapsed colossus of the Great Temple supposedly fell during an earthquake shortly after its construction. On moving the temple, it was decided to leave it as the face is missing. 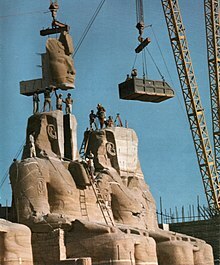 The salvage of the Abu Simbel temples began in 1964 by a multinational team of archeologists, engineers and skilled heavy equipment operators working together under the UNESCO banner; it cost some US$40 million at the time (equal to $300 million in 2017 dollars). Between 1964 and 1968, the entire site was carefully cut into large blocks (up to 30 tons, averaging 20 tons), dismantled, lifted and reassembled in a new location 65 metres higher and 200 metres back from the river, in one of the greatest challenges of archaeological engineering in history. Some structures were even saved from under the waters of Lake Nasser. Today, a few hundred tourists visit the temples daily. Guarded convoys of buses and cars depart twice a day from Aswan, the nearest city. Many visitors also arrive by plane at an airfield that was specially constructed for the temple complex. 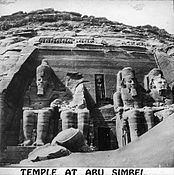 The Great Temple at Abu Simbel, which took about twenty years to build, was completed around year 24 of the reign of Ramesses the Great (which corresponds to 1265 BC). It was dedicated to the gods Amun, Ra-Horakhty, and Ptah, as well as to the deified Rameses himself. It is generally considered the grandest and most beautiful of the temples commissioned during the reign of Ramesses II, and one of the most beautiful in Egypt. Four colossal 20 metre statues of the pharaoh with the double Atef crown of Upper and Lower Egypt decorate the facade of the temple, which is 35 metres wide and is topped by a frieze with 22 baboons, worshippers of the sun and flank the entrance. The colossal statues were sculpted directly from the rock in which the temple was located before it was moved. All statues represent Ramesses II, seated on a throne and wearing the double crown of Upper and Lower Egypt. The statue to the left of the entrance was damaged in an earthquake, leaving only the lower part of the statue still intact. The head and torso can still be seen at the statue's feet. Next to the legs of the colossi, there are other statues no higher than the knees of the pharaoh. These depict Ramesses's chief wife, Nefertari; his queen mother Mut-Tuy; his first two sons, Amun-her-khepeshef and Ramesses; and his first six daughters: Bintanath, Baketmut, Nefertari, Meritamen, Nebettawy and Isetnofret. The entrance itself is crowned by a bas-relief representing two images of the king worshipping the falcon-headed Ra Harakhti, whose statue stands in a large niche. This god is holding the hieroglyph "user" and a feather in his right hand, with Ma'at, (the goddess of truth and justice) in his left; this is nothing less than a gigantic cryptogram for Ramesses II's throne name, User-Maat-Re. The facade is topped by a row of 22 baboons, their arms raised in the air, supposedly worshipping the rising sun. Another notable feature of the facade is a stele which records the marriage of Ramesses with a daughter of king Hattusili III, which sealed the peace between Egypt and the Hittites. The inner part of the temple has the same triangular layout that most ancient Egyptian temples follow, with rooms decreasing in size from the entrance to the sanctuary. The temple is complex in structure and quite unusual because of its many side chambers. The hypostyle hall (sometimes also called a pronaos) is 18 metres long and 16.7 metres wide and is supported by eight huge Osirid pillars depicting the deified Ramses linked to the god Osiris, the god of the Underworld, to indicate the everlasting nature of the pharaoh. The colossal statues along the left-hand wall bear the white crown of Upper Egypt, while those on the opposite side are wearing the double crown of Upper and Lower Egypt (pschent). The bas-reliefs on the walls of the pronaos depict battle scenes in the military campaigns the ruler waged. Much of the sculpture is given to the Battle of Kadesh, on the Orontes river in present-day Syria, in which the Egyptian king fought against the Hittites. The most famous relief shows the king on his chariot shooting arrows against his fleeing enemies, who are being taken prisoner. Other scenes show Egyptian victories in Libya and Nubia. Due to the displacement of the temple and/or the accumulated drift of the Tropic of Cancer during the past 3,280 years, it is widely believed[by whom?] that each of these two events has moved one day closer to the Solstice, so they would be occurring on October 22 and February 20 (60 days before and 60 days after the Solstice, respectively). "When King Psammetichus (i.e., Psamtik II) came to Elephantine, this was written by those who sailed with Psammetichus the son of Theocles, and they came beyond Kerkis as far as the river permits. Those who spoke foreign tongues (Greek and Carians who also scratched their names on the monument) were led by Potasimto, the Egyptians by Amasis. 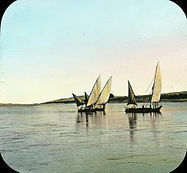 Kerkis was located near the Fifth Cataract of the Nile "which stood well within the Cushite Kingdom." The temple of Hathor and Nefertari, also known as the Small Temple, was built about one hundred metres northeast of the temple of pharaoh Ramesses II and was dedicated to the goddess Hathor and Ramesses II's chief consort, Nefertari. This was in fact the second time in ancient Egyptian history that a temple was dedicated to a queen. The first time, Akhenaten dedicated a temple to his great royal wife, Nefertiti. The rock-cut facade is decorated with two groups of colossi that are separated by the large gateway. The statues, slightly more than ten metres high, are of the king and his queen. On either side of the portal are two statues of the king, wearing the white crown of Upper Egypt (south colossus) and the double crown (north colossus); these are flanked by statues of the queen. Remarkably, this is one of very few instances in Egyptian art where the statues of the king and his consort have equal size. Traditionally, the statues of the queens stood next to those of the pharaoh, but were never taller than his knees. 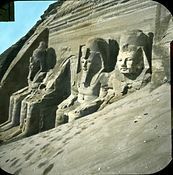 Ramesses went to Abu Simbel with his wife in the 24th year of his reign. As the Great Temple of the king, there are small statues of princes and princesses next to their parents. 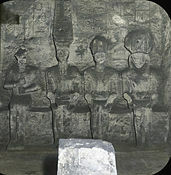 In this case they are positioned symmetrically: on the south side (at left as one faces the gateway) are, from left to right, princes Meryatum and Meryre, princesses Meritamen and Henuttawy, and princes Rahirwenemef and Amun-her-khepeshef, while on the north side the same figures are in reverse order. The plan of the Small Temple is a simplified version of that of the Great Temple. As the larger temple dedicated to the king, the hypostyle hall or pronaos is supported by six pillars; in this case, however, they are not Osiris pillars depicting the king, but are decorated with scenes with the queen playing the sistrum (an instrument sacred to the goddess Hathor), together with the gods Horus, Khnum, Khonsu, and Thoth, and the goddesses Hathor, Isis, Maat, Mut of Asher, Satis and Taweret; in one scene Ramesses is presenting flowers or burning incense. The capitals of the pillars bear the face of the goddess Hathor; this type of column is known as Hathoric. The bas-reliefs in the pillared hall illustrate the deification of the king, the destruction of his enemies in the north and south (in this scenes the king is accompanied by his wife), and the queen making offerings to the goddess Hathor and Mut. The hypostyle hall is followed by a vestibule, access to which is given by three large doors. On the south and the north walls of this chamber there are two graceful and poetic bas-reliefs of the king and his consort presenting papyrus plants to Hathor, who is depicted as a cow on a boat sailing in a thicket of papyri. On the west wall, Ramesses II and Nefertari are depicted making offerings to god Horus and the divinities of the Cataracts—Satis, Anubis and Khnum. Ramesses offering to seated god Ptah. Frieze inside the Small Temple. ^ Centre, UNESCO World Heritage. 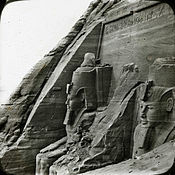 "Nubian Monuments from Abu Simbel to Philae". whc.unesco.org. Retrieved 2018-02-24. ^ Verner, Miroslav. Temple of the Word: Sanctuaries, Cults and Mysteries of Ancient Egypt. (Cairo: The American University in Cairo Press, 2013). ^ a b Hawass, Zahi. The Mysteries of Abu Simbel. (Cairo: The American University in Cairo Press, 2000). ^ Lane E, "Descriptions of Egypt," American University in Cairo Press. pp.493-502. ^ Spencer, Terence (1966). 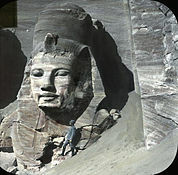 The Race to Save Abu Simbel Is Won. Life magazine, December 2, 1966. ^ "king Psammetichus II (Psamtik II)". Touregypt.net. Retrieved 2011-11-20. ^ "Climate: Abu Sinbil – Climate graph, Temperature graph, Climate table". Climate-Data.org. Retrieved 14 August 2013. ^ "Abu Simbel Climate and Weather Averages, Egypt". Weather to Travel. Retrieved 12 July 2013.